PPUFFY was left at the shelter BLIND and at 10 years old and he deserves so much better! He needs help now, this is not how he should be spending his senior years. Please SHARE, he's SUCH an angel he needs a FOSTER or ADOPTER NOW. 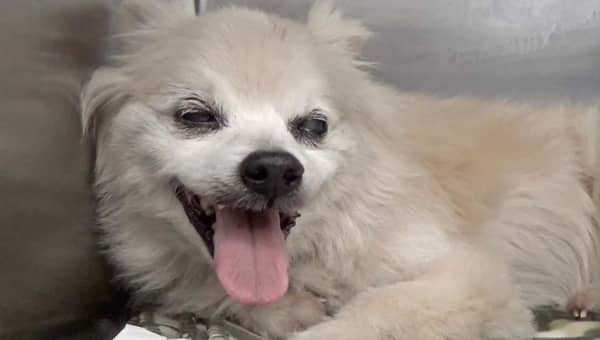 #A5151779 My name is PUFFY and I'm an approximately 10 year old male Pomeranian. I am not yet neutered. I have been at the Carson Animal Care Center since 2/16. I will be available on 2/16. You can visit me at my temporary home at C401. My former family who owned me for had to give me up because too old and blind. 1 Response to "10-years-old blind owner surrender senior begging to be saved from deadly shelter"
They should not be able to get another dog. We need a database for this across this nation. Their names should be entered and it should be accessible to breeders and shelters and rescues.